When Brittany Maynard announced her plans to end her life on November 1st, the news rippled through social and national media like the foreshocks of an earthquake. Ms. Maynard is a beautiful, relatable 29 year-old woman with a fatal brain tumor, who went public earlier this month with her decision to move to Oregon in order to obtain barbiturates via the Death with Dignity Act. She has partnered with the organization Compassion and Choices to create a campaign to advocate for increased access to aid in dying legislation. 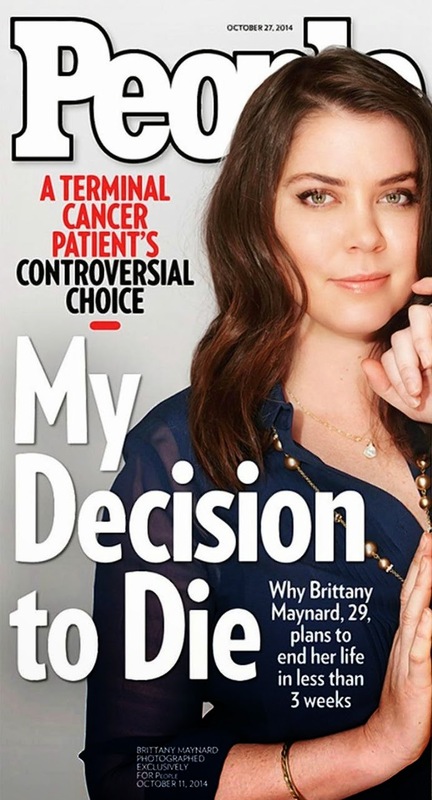 As bioethicist Arthur Caplan said on NBC News, "there are no new arguments in anything Brittany has to say," and yet, she has captured the attention of a new generation, and sparked a conversation about the amount of control patients should have over their own deaths. In this post I will not opine about whether patients should have access to physician aid in dying. But I will share my concern that like Brittany's death, the timing of this conversation is simply too soon, and threatens to curb the groundswell of interest in palliative care and hospice that stands to benefit many more people than physician aid in dying ever will. There is increasing appreciation that Americans don't die well. Patients receive chemotherapy and intensive care up until the last weeks of their lives, rather than spending time with loved ones. They infrequently die at home, as most people would prefer to do, often because they seek aggressive care in hopes that extra treatments will give them more time. There are many factors that contribute to this avalanche of medical care at the end of life, among them the reluctance of physicians to discuss prognosis with patients and to plan for what to do if the third line chemotherapy for metastatic cancer does not go as hoped, as well as our cultural narrative about "fighting" illness, a narrative with no room for vulnerability, future planning, or asking for help. In addition to the fear of honest conversation, there is a fear of inaction on the part of physicians. I noticed this firsthand this week when I was teaching ethics to medical students who were fresh off their first clinical rotations. One student struggled with the idea of withholding CPR from an elderly woman with a previous do-not-resuscitate order who suffered an unexpected cardiac arrest. The patient's advance directive was not readily available, so the medical team attempted to resuscitate the patient until they were able to track down the physical advance directive and confirm her preference. "It seemed so logical to give her CPR in that situation, since there was a chance of saving her life," he said. "What were we supposed to do, just put her in a body bag?" He was not alone; other students told me about situations in which they wanted to encourage patients with poor prognoses to "be full code" with the assumption that this would give them more time with their families, or to offer patients procedures or treatments that might have any slight chance of increasing survival, even when there was a greater overall likelihood of harm. The students had only been practicing medicine for a few months, yet already felt an obligation to act in any way that prolonged life, no matter the risks or alternatives. There is also increasing appreciation that we can do better by patients at the end of their lives. Dying patients who receive attention to their symptoms, as well as their psychosocial and spiritual needs in coping with advanced illness, not only rate that they have better quality of life, but actually live longer than patients who receive our current standard of care. A recent Institute of Medicine report recommended an increase in advance care planning, shared decision making and access to palliative care to improve care of the dying. Atul Gawande's book Being Mortal has rocketed to the top of the bestseller list and generated an incredible amount of positive attention to palliative care and its promise in ameliorating the crisis state of end-of-life care in America. The recent buzz about physician aid in dying jeopardizes that momentum, by steering the conversation toward the extreme rather than focusing on a solution for the broad middle ground. Patients and families are already wary of morphine, and suspect that it is used not only to palliate but also to hasten death. I suspect that if physicians were also given the power to prescribe barbiturates for aid in dying, that patients may fear that shifting gears from curative intent treatment to comfort-focused care at the end of life care might mean consenting to euthanasia, and shy away. And if conservatives erupted in "death panel" cries over physician reimbursement for advance care planning, imagine the backlash against aid-in-dying legislation. Even though they are distinct, opponents won't hesitate to bundle these together and alienate patients from palliative care and hospice out of fear. Moreover, I worry that physician aid in dying is yet another way to "do something," rather than simply being present with patients through the uncomfortable, unseemly dying process. I was surprised to see an overwhelming amount of support in the comments responding to Brittany's video, but on closer examination, many comments are simply anti-death: "Brittany, I salute you…. I have seen the most heinous of deaths and deaths prolonged because of guilt of the family, keeping people alive who are suffering" said one People.com commenter. A twitter post read: " If a woman wants to die on her own terms & not suffer a horrendous death by cancer, let her." These posts present a false dichotomy of choices: suffer a horrendous death by illness, or choose death by fatal ingestion. This is not the case. In the vast majority of cases, hospice care can bring relief and comfort to patients and their loved ones, and facilitate peaceful dying without the need to resort to a pill to speed things along. Patients need to know that they will not be abandoned when treatments fail, and there are more ways to preserve dignity in the dying process. They also need to be free of any possibility of coercion-- the greatest fear that most people have about the end of life is being a burden to their families. How terrible to contemplate patients choosing aid-in-dying to save money, or because they are out of options for compassionate home or residential hospice care, or worse, because they feel pressure to end the situation quickly. We live in a society where we are never content to be still, or feel like there is a situation we can't do something about. But when it comes to matters of death and dying, we owe it to ourselves to slow down. Talk with our patients and our own families about what is important. Learn what is making a dying person suffer, and either help her through it, or be present with her in her suffering. We need to ditch the fighter narrative, which empowers some but leads others down a fruitlessly aggressive path, and leaves them feeling stranded when the battle is lost. And as physicians, we need to let go of our need to be the hero, and recognize when to shift gears and help patients find the resources they need to feel comfortable and safe. Until everyone has access to comprehensive care, and information to make good choices about death and dying, it is too soon to talk about another "something" we can do to make the situation go away. This issue is awash in nuance and I am appreciative of Dr. Petrillos excellent discussion. I heartily agree with Dr. Petrillo that it is in society's best interest to capitalize on this upsurge in attention to quality and character of care for the dying by bringing improvements to their quality of living. We need grassroots action to transform the economic structures that fail us in this way, however I am not sure this discussion will wait until "everyone has access". As dedicated Palliative Care practitioners working in the trenches that know that presence eliminates most impulses for the artificially ending of life, we have been taught by experience to trust the process of natural dying. However, despite the six year wound from Sarah Palin's Death Panel lie, this "genie" can't be wished back in the bottle until the shortage of Speciality Palliative Care is solved or the quality of basic Palliative Care magically improves wherever the seriously ill receive care. I suspect the desire for aid in dying reflects more than avoidance by merely doing "something". I think it also reflects the emerging voice of a generation for which empowerment is non-negotiable. Thanks for a thoughtful post. One-issue movements, like the aid-in-dying movement seem, by their nature, dangerously reductionist and often obscure complexities. Agree especially with your important closing reminder that a fundamental plank of any meaningful change in health care for the dying is improving access to comprehensive care & increasing access to information about choices. Thank you for this thought-provoking post. I agree completely that the “fighter narrative” is hardly one-size-fits-all.” It is probably not even “one-size-fits-most,” and as Dr. Petrillo so eloquently describes, it can in many cases be counterproductive or detrimental. However, we have to be careful not to generalize. As doctors and palliative care experts in particular, one of our most important charges is to deeply understand each and every one of our patients and their unique narratives, and to present and facilitate choices that are consistent with their expressed values, beliefs, and priorities. I agree that Brittany Maynard is most certainly an outlier, and we know too little and her situation and motivations to judge her take-the-bulls-by-the-horns approach. Given what we do know, it is entirely possible that her chosen course—and even her entry into the public spotlight—are consistent with who she is deep down. If that is the case, we should honor her choices. And only in hindsight will we know whether the public attention she garners will prove to be timely or ill-timed. I would hate for this unfortunate woman’s struggle to become yet another divisive element in a conversation already fraught with so much extremism and fear. We can do better than that, as a profession. Let us respond with a more unifying message. Let it be that when we call ourselves “doctor,” we embrace our role in deeply understanding our patients and the role of their illness in their life’s narrative, empowering our patients to reflect on their options and choose a path consistent with their values, beliefs, and priorities, and providing them with the resources and expertise needed for their choice to produce the best possible outcome—for them. I think this is a message that anyone, anywhere on the bell curve, would be hard pressed to find issue with. Thank you for putting into words what I'd been thinking, as an Oregonian and hospice person reading about this young woman coming here to die. I've been involved in hospices for some 25 years in several states, as a volunteer, a nurse, an administrator, and now on a hospice board of directors. While living in the DC area, I attended the Supreme Court hearings involving "physician-assisted-suicide", as they called it then. As a hospice board member I've reviewed our own policy on "physician-assisted-death" or PAD as they call it now, to help our staff know how to work with patients who may state their intention to use the drugs provided through their physicians to hasten their deaths. We have found in Oregon that very few who have these drugs and also are receiving quality hospice care, actually use the drugs. It seems they want a "back-up plan" to be sure they have control. I certainly hope that Ms. Maynard opts to try hospice care. It would be wonderful to get the same PR for hospice and palliative care that PAD is getting at this point. Atul Gawande's beautifully written book, Being Mortal, should be read by every physician and nurse (I have two children who are physicians and will be receiving copies soon!). Having read a few of the web based articles, my dismay was related to the comments of a majority who do not understand hospice, palliative care, or even end of life. some equated hospice with hastening end of life. It has been very depressing for me and I know others who have long worked in this area. When PAS was on the ballot here in Maine several years ago, I actively worked to defeat it. The same lack of knowledge surrounding palliative care, hospice, and what dying involves seems to have not changed since then. How do we teach people; patients, family, providers, and the media? I would like to mirror some of the comments already made, that we can provide excellent care at the end of life to reduce suffering and bring comfort to the dying, (and their families), by increasing access to hospice and palliative care throughout the disease trajectory. I am so pleased to have many more conversations and awareness in the public eye, though there is a long, long distance to make hospice a household word (one of my own personal goals!) But a reminder to all my colleagues, we like to say in hospice, we hopefully "leave our agenda at the door" and enter a home with open hearts and minds, ready to listen to a patient's story and hear what THEIR wishes are; providing the information, access, and expertise needed without bringing our own values and judgements to their bedside. Patients I have cared for who used PAD at the end of their life, and also had the benefit of hospice, have had a profound effect on me, and though I don't believe that I would hasten my own death, I don't feel right telling someone else how they should experience their own journey. Today I demonstrated to a young man in his early twenties how to crush Lorazepam and mix it with liquid morphine and squirt the prescribed drugs into his uncle's mouth. I told the young man that I try to treat others as I would like to be treated, he said "of course everyone would rather sleep through this". His uncle was diagnosed with a terminal brain tumor six weeks ago and he was "given" three days to live by his oncologist. Two of my hospice patients this week have pleaded with me, "absolutely unbearable" one of my patients told me. I appreciate this discussion and I feel it falls short of revealing how WE would like to be treated, or helped at the end of our suffering. Anonymous, Hospice nurse, I just wanted to say that that breaks my heart. I am so sorry to hear these awful experiences you are having. However, while I am sure you are doing all you know, I strongly suspect that there were many things that could have been done or could be done for those patients that has not been done. Are they being cared for by a fellowship-trained HPM physician? Did you try escalating the dexamethasone, then dropping to 1mg/day when no QOL? Methadone? Adjuvant medications? Co-analgesics? Systemic anesthetics? Triptans? Are you screening for opioid-induced hyperalgesia? For benzo-induced delirium? It is easy for us docs to assume that since "I don't know what else to do for this patient, so there IS nothing else we can do." The fact is that there almost always IS something that will help the individual if we look hard enough. I am so sorry about your experiences, however; they sound terrible. I wish you the best. Too soon? Compassion & Choices and its predecessor organizations have been working to make aid in dying legal for 30 years. Just as Laura Petrillo argues that it's a false dichotomy to say that one suffers or one takes a lethal dose of barbiturates (and I agree), it's also a false dichotomy to suggest that better palliative care and hospice access obviates the need for people to have full autonomy at the end of their lives -- including the right to say when they end. We can and should improve palliative care and hospice care and make it more broadly available. We can and should have better conversations that allow people's wishes to be elicited, heard and respected. AND we can also allow them physician aid in dying as a legal option. Most of the people in Oregon who used that option were in hospice care. These are not oppositional ideas. There are people -- not many, it appears -- to whom the right to say "Enough" is crucial and foundational, not because they're in pain or in despair but because they want that level of autonomy. Brittany Maynard was clearly one of them. The idea that with better hospice care they will somehow be different people is just wrongheaded. I will decide. Not my hospice chaplain or my family or the state. Palliative care specialists and hospice proponents appear obtuse when they fail to grasp this. It's not about what you can provide; it's about what is important to me. I am a consult psychiatrist who is also working in palliative medicine. I agree completely with your article. people suffering from terminal illnesses such as metastatic cancer or end-stage organ failure can benefit from having a choice to receive or not receive treatment which offers a marginal chance of increasing their life span and no hope of recovery, but that often/usually subjects them to discomfort, remaining in the hospital and/or perhaps dying there, and even shortening their life. Giving them a realistic appraisal of the risks and benefits of the treatment and allowing them to decide without pressure to choose to treat or not is the compassionate and ethical thing to do. Palliative medicine is good at giving space for patients to make decisions in this way. What I have seen however is patients with serious or critical, but potentially treatable and at times curable (ie: infectious disease) are treated as if they are terminal and sometimes not offered treatment in the same way as others who really have no chance of recovery, Usually the reason given, if one is given, is that treatment is considered futile, when it may be actually not , strictly-speaking, futile (no chance of success) but actually just having a low chance of success. These patients deserve to be able to be treated if they want to be and understand the risks of the treatment. Let's not limit patient's ability to engage in acute treatment if they wish and are aware of the risks, and a provider is willing to treat them. This should apply to all patients but particularly if their illness is not considered terminal but is one that although it may be difficult or expensive or time-consuming to treat nonetheless has an actual chance of success.